PENCILLER: Bob McLeod, Brett Breeding. Cover by Kerry Gamill. The Kryptonite ring. A weapon given to Batman by Superman in the event he were to ever be the victim of mind control. But it’s so much more than that, isn’t it? It’s a symbol of trust between the world’s finest heroes. It represents Superman’s faith in Batman, his understanding of his own power, and his willingness to sacrifice himself for the greater good. It also represents the necessary cynicism that makes Batman who he is. It gives him the responsibility of keeping Superman’s power in check, and guarding the Earth’s greatest guardian. Over the years, many a creative team has made use of the Kryptonite ring. Perhaps the most notable was Jeph Loeb and Jim Lee in Batman: Hush. But it’s presence has been felt in stories like Superman/Batman: Public Enemies (also by Loeb), Infinite Crisis, and Superman and the Legion of Superheroes. Chip Kidd and Alex Ross also did a short story based around the concept for Mythology: The DC Comics Art of Alex Ross. It even survived the New 52 reboot. The concept has been resilient for so many years because it’s a good one. It makes sense. And it all began right here in Action Comics #654. The story, “Dark Knight Over Metropolis,” was a crossover between Superman, The Adventures of Superman, and Action Comics. So it ended up being the work of three different teams. But the story’s enduring legacy comes from its final two pages, so that’s what we’ll be looking at for the most part. I wish I could say “Dark Knight Over Metropolis” was an amazing story. But in truth it’s mostly underwhelming. Things also get convoluted when subplots involving Integrant, Cat Grant, and the street-level hero Gangbuster are woven in. But here are the important details: At a murder scene in Gotham City, Batman discovers a mysterious radioactive ring among the victim’s possessions. Batman’s investigation leads him to Metropolis, where he teams up with Superman and learns the ring is made of Kryptonite and was created by Lex Luthor. Batman keeps his possession of the ring a secret from Superman, but turns it over to him when the case is closed. 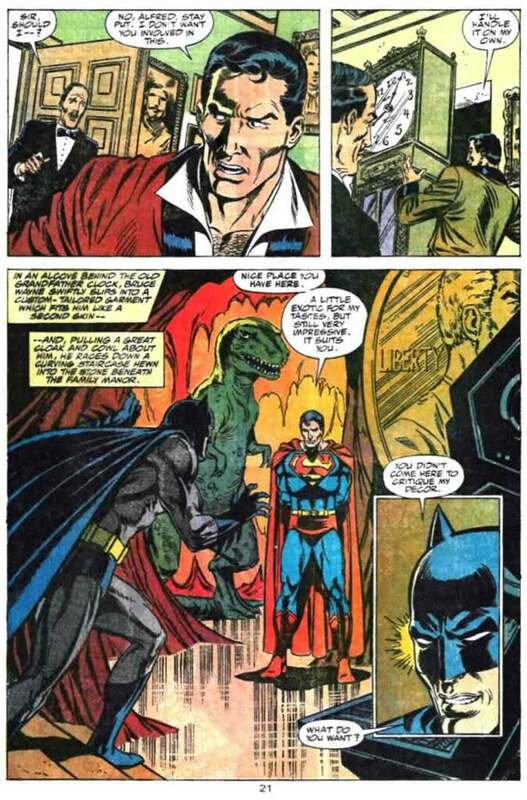 It’s important to note that these are the post-Crisis on Infinite Earths Superman and Batman. A few years after their first meeting in The Man of Steel #3, they’re still chilly toward one another. The story makes it clear they don’t always appreciate one another’s methods. But they know one another’s identities, and obviously have a kind of professional courtesy going. The pivotal moment in the issue happens after Bruce Wayne and Alfred have returned to Gotham. They suddenly find themselves with an uninvited guest in the Batcave. 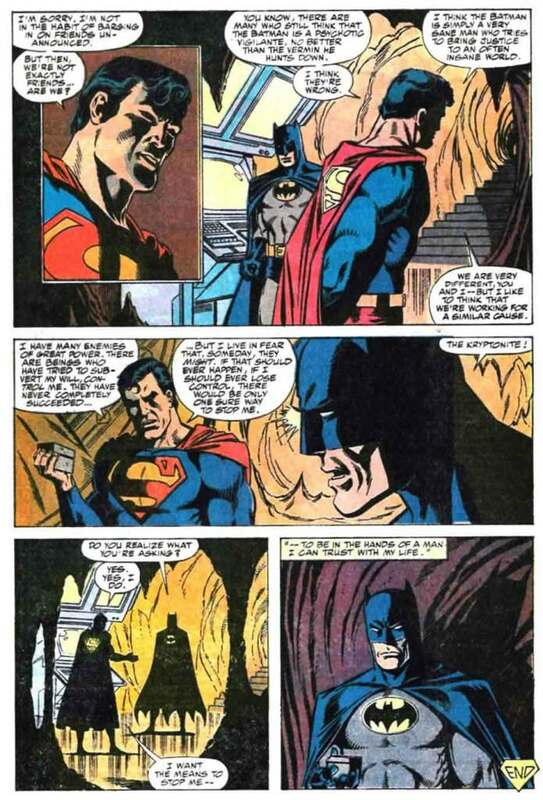 Batman descends into the cave to find Superman waiting for him. Bob McLeod and Brett Breeding give us a striking shot of Superman standing amongst some of Batman’s trophies. From a writing standpoint, it’s an interesting power play to have Superman simply show up in the Batcave because he can. Obviously he means no harm, but it’s a nice reminder that he can catch Batman off guard when he wants to. Superman says that while many think Batman is insane, he’s come to believe Batman is simply a sane man trying to bring justice to an insane world. He talks about living in fear that one day one of his enemies may gain control over him. If that were to ever happen, there’d be only one way of stopping him. With that, he pulls out a lead box with the Kryptonite inside. At only three pages, this is a pretty modest scene, considering what’s happening. But there’s something to be said for keeping things concise. Had they known they were making history with this scene, I’m sure they would have upped the ante a little bit. “Dark Knight Over Metropolis” is an unremarkable story that pays off with one of the great gems in the history of the Superman/Batman partnership. For that reason alone, it’s worth a read. Thankfully, DC reprinted it a few years ago in a trade of the same name. For more of “Best of Batman & Superman,” check out Gotham Knights #27 and Superman #165. Image 1 from superman86to99.tumblr.com. Images 2 from asylums.insanejournal.com. 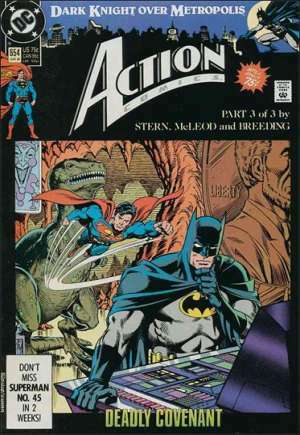 This entry was posted in Comic Books/Graphic Novels and tagged Action Comics, Action Comics #654 (1990), Batcave, Batman, Batman v Superman: Dawn of Justice, Best of Batman & Superman, Bob McLeod, Brett Breeding, Kerry Gamill, Kryptonite, Rob Siebert, Roger Stern, Superman, Superman: Dark Knight Over Metropolis on 02/24/2016 by primaryignition.